Mac OS X Automation Workshop - Thursday May 23, 2013 - 9:15am - 12:00pm - With AppleScript, Automator, and Services in Mac OS X, there’s more reason than ever before to begin automating time consuming and repetitive tasks. In this session, we’ll explore the potential of each of these automation technologies, discuss their benefits, and see how you can use them to boost your productivity and efficiency. 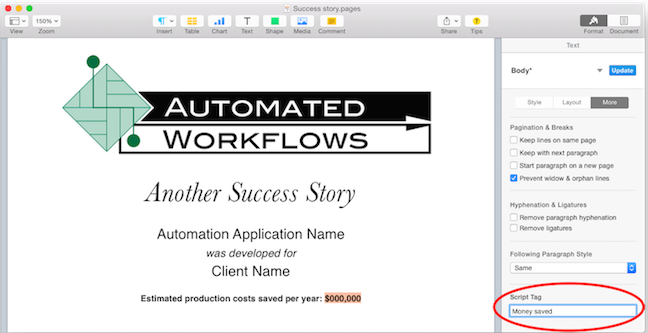 Join us as we dive right in, begin creating Automator workflows, building services, and writing some simple AppleScripts. Take time to finally learn how to take advantage of these unique technologies in a relaxed “learn-by-doing” class. 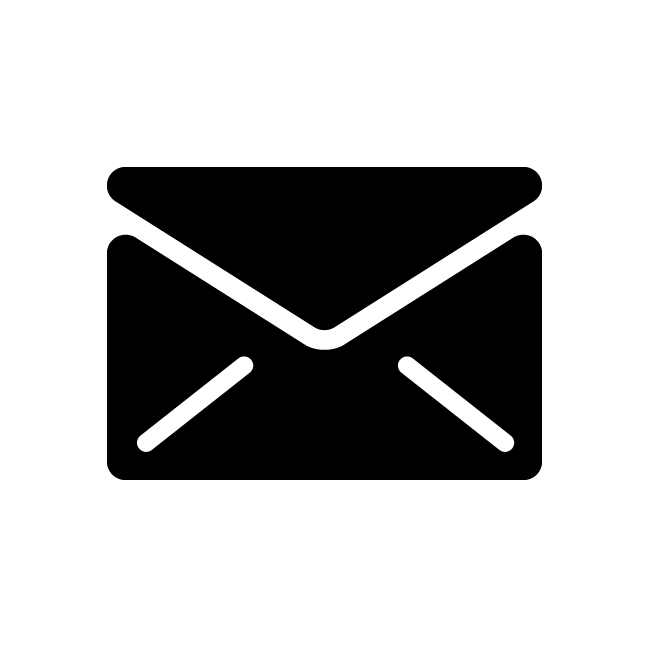 Giving Your AppleScripts a Face Lift - Friday May 24, 2013 10:45am - 12:00pm - You’ve been using AppleScript Editor on your Mac for years. You’ve developed dozens of useful scripts. It’s time to take those scripts to the next level by migrating them to AppleScriptObjC (Cocoa-AppleScript). In this session, we will expore the potential of this powerful technology. See first-hand how you can use Xcode to develop native Cocoa applications using AppleScript, complete with interfaces that allow you to capture data and provide detailed user feedback. In addition, learn how to add greater power to your AppleScript-based applications by integrating directly with Cocoa. If you're attending, be sure and find me to say "Hi." If you're a Mac developer, then you are probably aware that Apple will soon be requiring all applications submitted to the Mac App Store be sandboxed. A sandboxed AppleScript-based application is kind of an oxymoron. Sandboxing denotes that an application will run in its own isolated environment, for security reasons. Meaning that it doesn't have access to other applications on your Mac. However, this goes against the nature of AppleScript, which is designed as an inter-application scripting language. By writing AppleScripts, you can intertwine your various applications together to form complex workflows and automate time consuming things you would otherwise need to do manually. - File System - If you plan to use file/folder user interaction commands, such as "choose file", "choose folder", and "choose file name", then set this dropdown to "Read/Write Access". Do the same if you plan to use commands such as "open for access" and "write". 6. Add an entry for "com.apple.security.temporary-exception.apple-events". If you will have multiple entitlements, set this to be an array. Otherwise, set it to a string. Add UTI entries for each application your app needs to target. For example, for the Finder, add "com.apple.finder". For iTunes, add "com.apple.itunes". If you don't add a temporary Apple Events entitlement and the necessary UTIs, then your app will produce errors when attempting to target external applications. 7. If your app will write to a directory in the user's home folder, add an entry for "com.apple.security.temporary-exception.files.home-relative-path.read-write". Set this to be an array, and add paths to any folders you will write to, beginning each with a slash. I.e. /Desktop/ represents the user's Desktop. That should do it. Build and run your project, and check Xcode's debug console for problems. 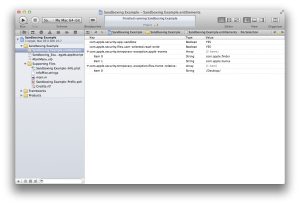 Download an example of a sandboxed Cocoa-AppleScript Xcode project here. 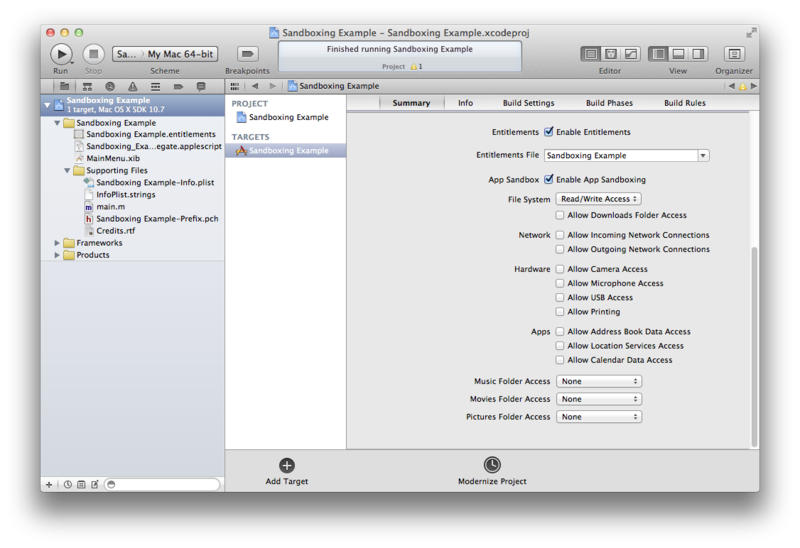 Official documentation for sandboxing an app can be found on Apple's developer website. Note that sandboxing doesn't affect strictly AppleScript applications. Other applications could potentially be affected, as well, including Automator* and numerous popular third-party applications. Well, to be fair, these applications could still work. They just couldn't be submitted to the Mac App Store once Apple's sandboxing requirement goes into effect, at least not without employing temporary entitlements. 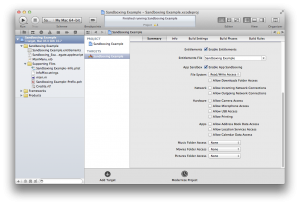 * In theory, Automator actions contained within a sandboxed application should not need to be sandboxed themselves. This is because they would technically fall under the scope of the application that loads and runs them - in this case - Automator. So, their capabilities should be governed by Automator's sandbox, which, due to the nature of Automator, should allow them to run unimpeded.